Taped 4/24 in Grand Rapids, Mich. It has been an interesting week for NXT. Maxine did a fun interview in her hometown Tuesday. Ryback is still picking up squash wins on Smackdown (is it just me, or does he look like a muscular version of Curley from the Three Stooges, the original?). Titus O'Neil and Darren Young had their debut match on Smackdown, a win over The Usos. And, Derrick Bateman is the only "Rookie" left on NXT. Will this mean that more Rookies will be brought on? And, what is the fall-out from the "firing" of Curt Hawkins and Tyler Reks? Have Maxine and Johnny Curtis figured out how to get the handcuffs off? [Q1] Matt Striker is in the ring to introduce NXT for the first time in some time. He says Josh Mathews is off the air due to his injury on Monday, and he will be calling the show along with various Superstars and Divas. Where's William Regal? They were a superb pair a few weeks ago. Striker also says Curt Hawkins and Tyler Reks have been fired. He congratulates Darren Young and Titus O'Neil on their move to Smackdown and praises them. He also says there are spots open, and Regal is scouting for new talent right now, and there will be some new folks on NXT. Striker introduces Regal's special match coordinator for the night, Hornswoggle. Hornswoggle comes out wearing jeans and his Funkasaurus jacket and hat. He dances with Striker, then speaks. Wait, Hornswoggle's first in-ring promo is being wasted on NXT?!?! He's happy that there are no challenges, redemption points, or Titus O'Neil. Odd, he was friends with O'Neil when he left. 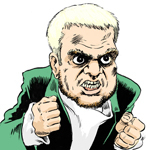 Hornswoggle is booking Tyson Kidd and Percy Watson against Johnny Curtis and Michael McGillicutty. Hornswoggle then calls Derrick Bateman out. Bateman mentions that he never got his match on Smackdown. JTG rushes down the ramp and plows Bateman from behind. He grabs the mic and gets in the ring. He says that NXT is whack, and used to be good when he was on it all the time. He's angry with Hornswoggle for not booking him, then Bateman sneaks up behind him and dumps him outside the ring. Hornswoggle books JTG against Bateman to start immediately. Striker invites Hornswoggle to the announce booth. Bateman starts off with tons of fire, with hard-hitting offense out of the gate. JTG struggles to get traction as Bateman continues to overpower him. JTG dodges the missile dropkick off the apron giving JTG control. JTG with a chinlock, and a "Master Bateman" chant breaks out. Striker actually corrects Hornswoggle's grammar. Bateman with a jawbreaker to regain control. JTG's funky suplex/faceplant gets a nearfall. After a struggle, Bateman with an odd bulldog or reverse STO thing for the win. WINNER: Derrick Bateman in 7:00. This match never really got out first gear, which is a common complaint for matches with JTG. [Q2] Backstage, Maxine and Johnny Curtis are arguing. Referee Scott Armstrong catches them at the door and wants to make sure they get handcuffed together. Maxine tries to use her charms to not have to wear them, but Curtis tries complimenting Armstrong's looks, too, and that snaps him out of the daze and he insists on handcuffing them together. Maxine blames Curtis's big mouth. They bump into Hornswoggle, and I guess we're supposed to forget about how he made out with her on NXT 3. He books Tamina Snuka and Kaitlyn against Maxine and Natalya. Hornswoggle eggs her on a bit and laughs as the handcuffs keep her from hitting him. They played a very effective video hyping the Cena-Lesnar match at Extreme Rules, incorporating Monday night's Raw. They left out all of the horrid contract signing bit. Backstage, Percy Watson meets Tyson Kidd backstage. If they are partnering, I guess Watson will take an injury in the next week or two that will have him on the injured list for a few months. Hah! Kidd tells Watson not to be so excited, admits that he's cursed and reminds, viewers of Trent Barreta and Justin Gabriel. Watson says he's in the same boat with Alex Riley. Riley's injured? Kaitlyn interrupts and says that she and Bateman have been really impressed with his work, and they want to know the name of his new submission finisher. He hasn't named it yet, and says he will ask his Twitter fans to help him name it. Natalya enters the picture. Natalya accuses Kaitlyn of flirting with Kidd, and says that she doesn't trust Kaitlyn. Kidd tells Kaitlyn not to worry about Natalya. Backstage, Natalya tells Maxine that she can't stand her, but reminds her that they are partners, and she wants to hurt Kaitlyn. Maxine's in agreement. Referee Armstrong reminds Johnny Curtis that he has to be ringside. As Tamina and Kaitly come out, they play a video comparing Tamina to her father. Good little package. Natalya plays up her current "mean prom queen" character on her way to the ring. Johnny Curtis is on commentary. At the bell, Snuka and Kaitlyn hit dropkicks to send the heel pair out of the ring. Curtis says he hates being stuck with Maxine. Natalya puts power on Kaitlyn, and plays up being jealous. She carries Kaitlyn to the corner and tags in Maxine as Striker brings up his recent history with Curtis. Natalya with a sweet abdominal stretch. Striker comments on Curtis's "Let's Get Weird" shirt, and says, "That's not a WWE t-shirt, is that a Barber Shop Window t-shirt?" Odd that they mentioned that site. Kaitlyn flattens Natalya with a low crossbody, but Natalya recovers and tags Maxine in. Maxine jumps off the top rope, lands on Kaitlyn, and locks in a front facelock with scissors. Kaitlyn tries to get a rope break, but Natalya tags in. Maxine gets mad, but Natalya continues the offense on Kaitlyn. [Q3] Double tag and Snuka comes in like white lightning. Snuka with a leg lariat to the arm, then a leg drop to put Maxine down. Snuka to the top rope, and lands the Superfly Splash for the win. WINNERS: Snuka & Kaitlyn at 4:45. Good match that I was hoping to see another five minutes of. But, since when did Natalya have feelings for Tyson Kidd in a storyline context? Post-match, Striker gets on the mic and reminds Maxine that she has to stay ringside for Curtis's match. He asks her not to put on the headsets so the audience doesn't have to actually hear her. Backstage, Tyson Kidd hears a commotion, and he finds Percy Watson out of action. Watson thinks it might have been Michael McGillicutty. Kidd runs for help. Striker invites McGillicutty to commentary. Pre-match, Hornswoggle comes out and takes McGillicutty out of the match to make it fair. Crowd chants for Kidd right out of the bell, and Kidd dominates Curtis with his speed and technical skills. Curtis surprises Kidd and uses his size to control the match. Kidd resets the match with his speed, and Curtis heads outside for a breather. Kidd runs out to meet him, and they brawl ringside. Kidd lands a running, jumping huracanrana from the apron and sends Curtis further away fromt he ring. Curtis is dominating with an armbar out of the break. McGillicutty talks up Johnny Curtis very well. In fact, McGillicutty is doing a great job on commentary, developing his own character in the process and reminding viewers of his recent feud with Kidd. It looks like Curtis almost bit Kidd's hand, and he continues to control Kidd with both holds and strikes. Curtis keeps drawing the ref's ire with corner work. Striker says Johnny Curtis trained with Killer Kowalski, which is a nice piece of history there. Kidd gets some space, which allows him go on the attack. McGillicutty puts some moves on Maxine in the interim. Curtis meets Kidd on the turnbuckle and lands a big superplex, but he's slow to cover and only gets a nearfall. Kidd rallies from the apron and heads up top again, and lands a blockbuster from the top rope for a nearfall. Very innovative. Kidd looks for a Sharpshooter or his new submission, but Curtis counters with an inside cradle for two. Curtis with a quick suplex sending Kidd flying, and covers for another close two count. Curtis goes to the top turnbuckle and tries a big double leg drop, but Kidd dodges. Kidd slaps on his new submission hold, kicking Curtis in the head when he tries to get out. Curtis taps after a few seconds. WINNER: Tyson Kidd in 10:30. Top-notch match. Curtis had a period of sustained offense that didn't get boring, the "combustible elements" on commentary didn't distract from the match, and Tyson Kidd should be playing ball with Chris Jericho, C.M. Punk, and Daniel Bryan. I love Kidd's new submission hold, it's like a Sharpshooter plus Hell's Gate. Post-match, Michael McGillicutty looks disappointed at the match outcome, and stares down Kidd. I guess that feud isn't quite over yet. Striker says we'll be seeing new faces soon and Regal will return next week. Final Reax: NXT was good this week and continued story development: Derrick Bateman and JTG feuding, Kaitlyn and Natalya getting some time against each other, and the potential pairing of Percy Watson and Tyson Kidd. NXT continues to have a logical consistency that both Smackdown and Raw lack, and it helps keep the viewer "in the moment" instead of scratching their heads. Even Hornswoggle proved to be a better authority figure than Teddy Long, as he enforced fairness and made it clear that taking out half a tag team pre-match would not be accepted. The idea of rotating the wrestlers on commentary to fill in Regal's spot and using Striker instead of Mathews also made a lot of sense and was innovative; they could have just as easily thrown Cole on there, but this allowed someone like Michael McGillicutty to get that much-needed experience of flying solo.